The holiday season is that magical, wonderful time of the year when we get together with family and catch up with old friends. Our tables groan under the weight of food, our homes are cheerily decorated and the children count down the days in eager anticipation. But it’s also that time of year when we eat too much, drink too much and overspend. The overspending I can’t help you with, but I can help you with a few healthy, holiday smoothie recipes. 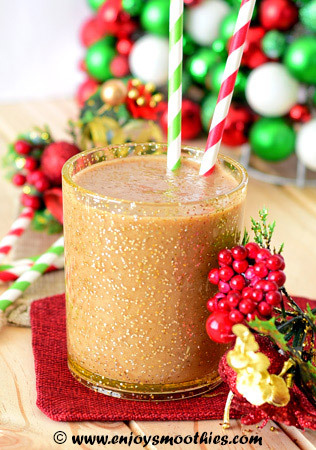 If you feel you’ve over done the turkey, stuffing, ham, pie and pudding, then lighten your diet a little by trying one of our Christmas smoothies. These smoothies have all the traditional flavors one expects at this time of year, but not the calories. Try one as a healthy starter to the day, as a between-meal snack or even as a healthier dessert. You can go all traditional and try a smoothie nog. What is a smoothie nog? 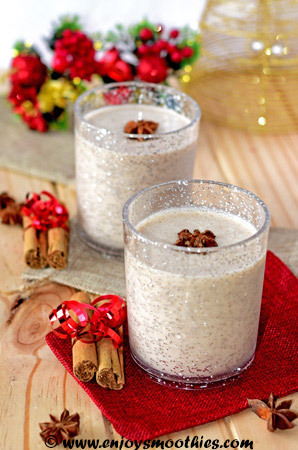 Well, it’s a healthy take on the traditional eggnog. These are healthier versions that taste like the real thing. You can try a cranberry smoothie, always traditional at this time of the year, or you can spice things up with a ginger smoothie. Add the coconut milk, bananas, yogurt, nutmeg, cinnamon and maple syrup to your blender. Blend on high until all the ingredients are smooth and creamy. Add the almond milk, bananas, nutmeg, cinnamon, almond extract, dates and maple syrup to the blender. Blend until smooth then serve in two glasses. These smoothies are made with eggnog, so are probably not really all that low in calories, but if you love eggnog then these are for you. Place the eggnog, banana, yogurt, nutmeg and cinnamon into your blender and blitz on high until all the ingredients are creamy. Then serve in decorative glasses. Blend together the eggnog, banana, yogurt, honey, vanilla extract and chai spice until you have thick, creamy smoothie. Pour into serving glasses and enjoy. Add the spices to a container and mix well together. Store the spice blend in a cool dark place in a covered container.